My first flight in an airplane was when I was twelve years old and flew from Seattle, Washington to Oklahoma City, Oklahoma. It was just my brother and I and he is four years younger than me. My father delivered us to the cabin door to the stewardess and then my grandparents picked us up at the cabin door in Oklahoma City. Of course, this was before all of the security precautions in the airports that we have now. The flight was so much fun. The stewardess gave my brother and me everything that was available in food and drinks (this was when they actually served food). We had chewing gum for the take-off and landing to help with the ear’s popping; we got flight wings to wear; and during one stop-over, we got to sit in the flight cabin with the pilot. Flying was an amazing adventure for me at the age of twelve and that feeling has never changed. I’m still in awe when flying commercial at 35,000 feet. Years later, I had moved from the Puget Sound Area to where my grandparents lived in Bethany, Oklahoma. Then, I got a job in Chickasha, Oklahoma and met this great couple, Dawn and Leonard Hilliary. They became like family to me. Dawn is no longer with us but she and Leonard made a big difference in my life. Anyway, Leonard is a pilot and at the time he had an airplane at the Chickasha Airport. He did air photography and he also had a contract with the electric company to fly the electric lines looking for problems. I went with him a few times and my job was to look for woodpecker holes in the electric poles and any other problems that might cause electrical issues for the public. Can you imagine flying in a small single engine airplane very low and very slow, looking for woodpecker holes? After that experience, I was totally hooked on flying. I told Leonard that I wanted to learn to fly and he set me up with a flight instructor. At this time I was a single mother with two children and was working as an accountant for a small Certified Public Accountant firm. As you might guess, money was tight and I wasn’t sure how I was going to pay for a silly thing such as flight lessons. The solution was to find small clients to work on in the evening. Walla! I found out that there were two tests involved in getting your flight certificate. The first being ground school and the second being the practical test where you actually fly the plane. Hello Cary! I attended ground school at the local college in the evenings. There were a few times during ground school when I asked myself, “Are you sure this is what you want to do?” I had no idea that there was so much involved in flying a teeny-weeny little airplane. Wind direction, magnetic north, weather knowledge, understanding the airplane instruments and the list goes on and on. The actual flying was just as difficult as you need to utilize what you have learned in ground school. Another important process to learn is how to land the airplane in an emergency situation like when the engine quits. One thing about learning to fly in Oklahoma is that the terrain is very flat and there are lots of cow fields. A single engine airplane can glide quite a ways if it is done properly. Finally, I have passed the written exam and moving along with the on-hands flight training. One day, my instructor and I were doing what you call touch and goes. This is where you land the airplane and then power up and do an immediate take-off. Suddenly, my instructor told me to tell the tower that we were coming in for a full stop. When I landed the airplane, I taxied to the terminal. I was starting to shut down the airplane and my instructor got out. Before shutting the door, he turned around and said, “Cary, don’t shut down the airplane. Take it up for two more touch and goes.” I thought to myself, Oh my God, it’s SOLO time. I talked to the tower asking permission to taxi to the active runway for touch and goes. 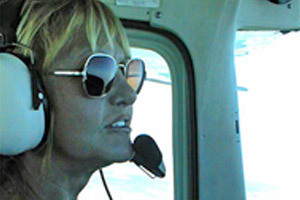 I am totally in another thought plane (wherever that was) and when I was on the “downwind leg,” I glanced over to the co-pilot seat and really realized that my instructor was not sitting there. I was actually in the plane all by myself. I was the only one in control of the airplane and just the slightest error could end everything. I look back at my life and there are three situations that are so far above any of my other life experiences as far as pure awesomeness. They are giving birth to my two children and my SOLO flight. Now I have passed the written exam, did my solo flight and now It was necessary to get a physical exam. Only doctors approved by the Federal Aviation Administration can certify the physical examination. Several years before, I had physical problems and ended up losing my left kidney. Never in my wildest dreams did I consider that this may be an issue, but it was. I had to get special permission from the FAA by having my doctor write a letter explaining the consequences of my kidney loss. It took a few months but finally, my physical was approved and it was time to go forward. Later, life moved me to Key West, an island in the Florida Keys. When you take off from the airport, you are flying over water. There are lots and lots of ocean with sharks and not pastures with nice calm cows. Now you get the picture. Several of my friends from Oklahoma asked me, “Aren’t you afraid to fly over the water with just one engine?” I hadn’t been concerned and then realized that maybe I should be concerned. After that cognition, I worked harder on my emergency landing procedures (find that island!). I was informed that there was a Navy Flying Club at the Key West Naval Air Station. This was exciting information and I was lucky enough to become a member. How amazing it was for me to be able to take off on a runway that goes on forever? There were three runways so you didn’t have to worry about “crosswinds” and you could do three touches and goes before taking off. Really awesome! Then you were also flying with the big guys. It was during this time that I also had my terrifying experience in the Bermuda Triangle. Please read my story and contact me with any questions that you might have.